When I woke up yesterday I had no intention of losing my wedding rings. In the morning I hugged Malky the cat and Ava, my daughter. In the afternoon, I did a silly dance with the curtains wide open, daring my neighbors to judge me. Around five o’clock I indulged in a green bottle of bubbly water while sitting by a glittering summer-filled window. I felt the heat (110F in the shade) radiate on my face and I smiled, happy to be inside. I fidgeted with my rings, as I often do whenever happy thoughts cross my mind. Two hours later, Ava’s bedtime arrived. I carefully placed my rings on the coffee table to lotion up my hands. Ava singsonged across the room, her entire body full of giggles, and asked if she could try the rings on. 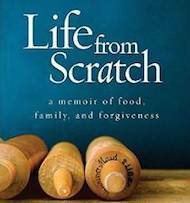 I nodded with a smile and she tossed them on her tiny fingers. 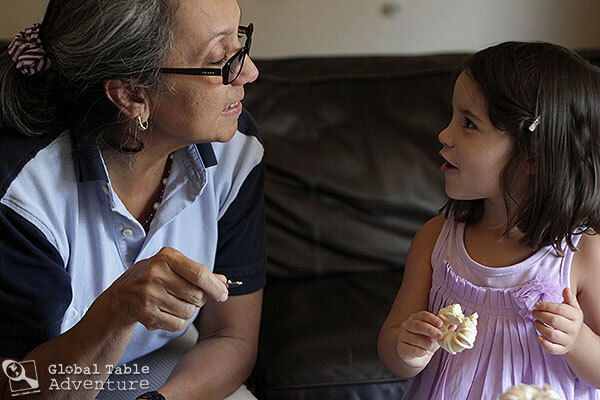 I remember laughing and I remember her running into the kitchen to show papa. Hours later, as Keith and I were heading to bed I realized my fingers were ringless. And that is all I remember until I looked down onto our busy, busy rug and two little glints caught my eye. When I realized what they were, my heart started beating again. I find it ironic that the very week we make kransekake, I lose my wedding rings. This is a tower made up of ring upon ring upon ring. The symbolism of it all is meta. Here’s what I think – if you ever lose your wedding rings, you can just wear this cake. It will comfort you. 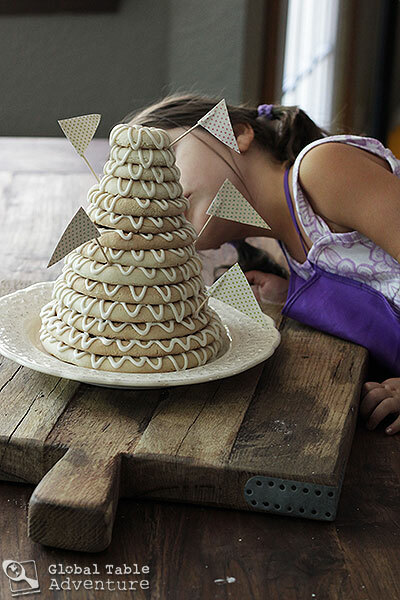 The kransekake is everything you love about playdoh, cookies, and cakes – all rolled up into one stunning cake. It tastes of sweet almond paste, dreams, and smiles. 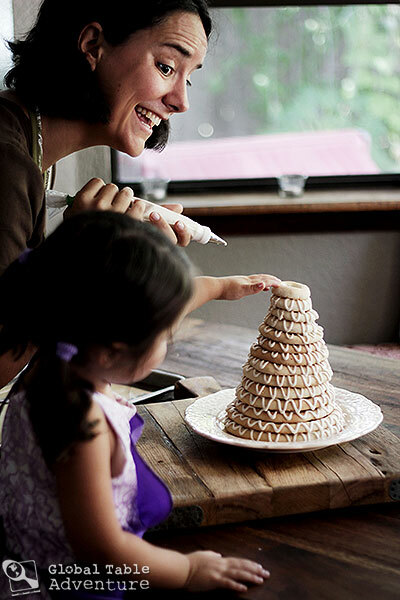 The Kransekake (which translates to wreathe cake) is often served for weddings in giant portions, or at birthdays and baby showers in smaller portions. Tradition dictates that there be 18 rings, although people vary it up all the time. 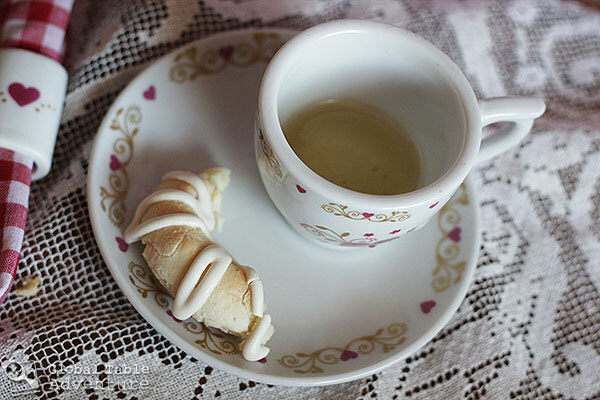 Today I’m sharing a kransekake that is a bit more manageable for, say, a travel-themed birthday party or family gathering. She’ll will feed 8-10 adults. Hardanger Fjord Norway. 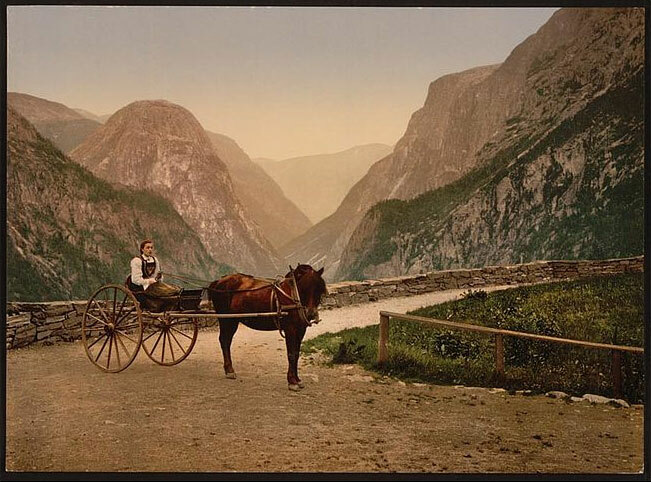 Photo by Snapshots of the Past. One important thing with this recipe is to measure everything by weight. This will ensure you have the proper ratio, no matter how your almonds are cut. You can sometimes do this on the scales at the grocery store. It’s okay, that’s what they’re there for. 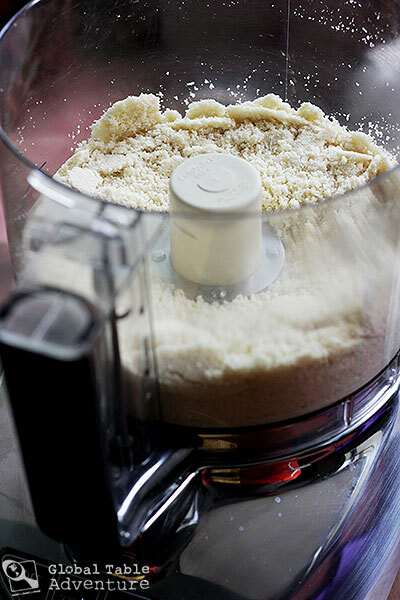 Once you have 8 oz almonds, grind them up in a food processor. Pulse until they transform from hard nut to fine powder. When they are ready, the powder will just begin to “cake up” on the sides of the processor. Be careful not to over process or the powdery almonds can turn to almond butter. and the flour. You”ll need between 3/4 and 1 cup. Gently pulse this cloud of goodness together, evenly distributing the ingredients. Finally, stream in the two egg whites and oil. Pulse again until the mixture comes together into a soft ball. 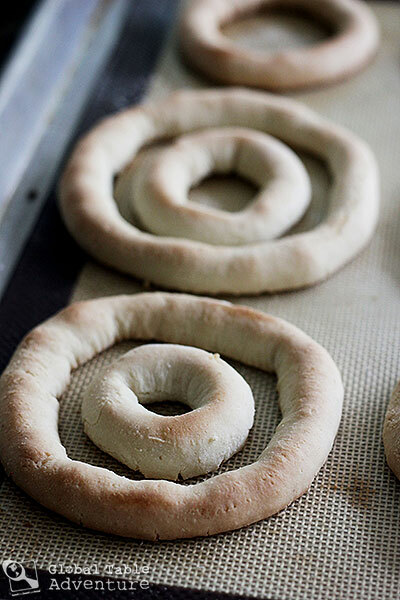 You should be able to roll this dough into ropes by lightly flouring your hands. If it is much stickier than that, you’ll need to add more flour. 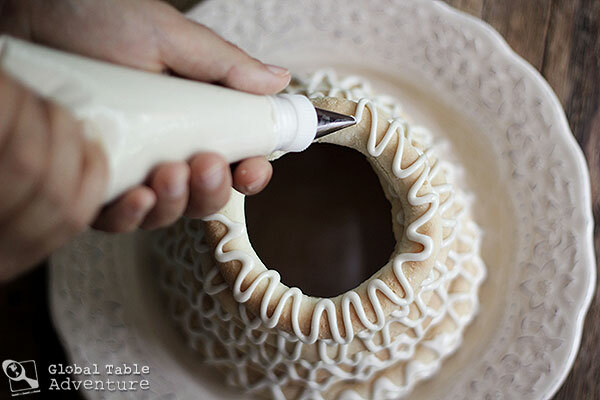 While most people use kransekake molds which set your cake to be a certain size, you can still make a beautiful cake without them (the molds, not the people). Either way, always start by rolling out the smallest rings and go larger. This makes sure they will stack and it also makes sure you don’t come up short before you get to the smallest ring, leaving a huge opening in the top of your cake. Here’s what I worked out: make 2 of each length: 4″, 6″, 8″, 10″, 12,” 14″ (they should all be equal thickness – about 1/2 inch around). Use a ruler, it really helps. 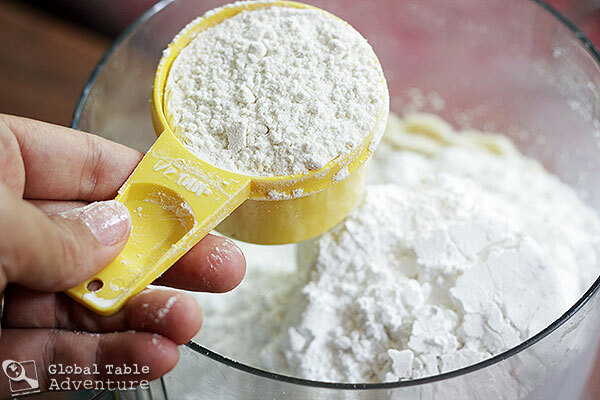 And work with lightly floured hands. Even with two of the same size, they bake up with slight variations, making a smooth stack. If you really want, you can make 1 each of 4″, 5″, 6″, etc but you might have to think a little harder when organizing them on the baking sheet. and the second size … two inches longer. While you work, keep the dough covered with saran so that it does not dry out. 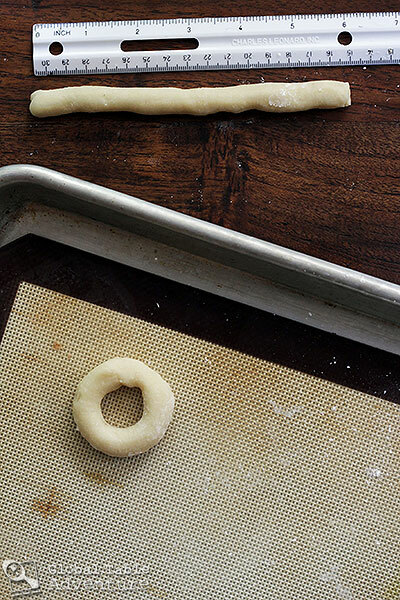 You can place the rings inside each other for baking as long as they do not touch. I managed to fit them all on two baking sheets. Here’s everything but the two largest sizes (4 total rings). Bake at 400F for 12-15 minutes or until puffed and lightly golden brown. Let cool completely. 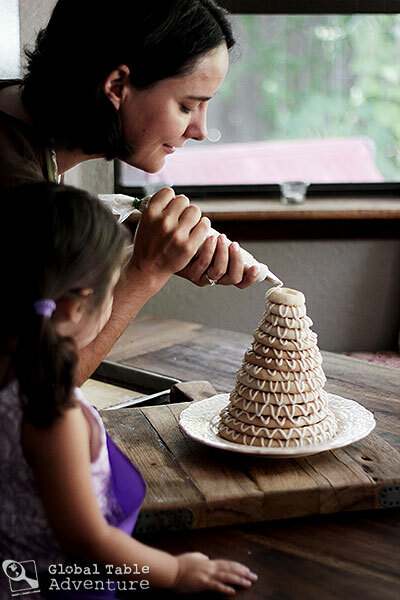 Since you have two rings of each length, you can make two short cakes (fun idea for a set of twins) or one tall cake. Pile them up and see what you like! NOTE: I just realized the two short towers are missing the two largest rings, so they would be taller that pictured. This really technical. Carefully pipe zig-zags all around the largest ring. Do it in a squiggly-wiggly hap-hazard way. 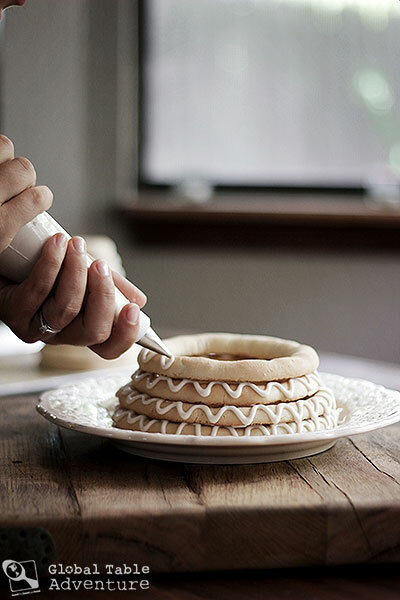 The one thing you need to be sure of, is that you get the icing on the side and the top of the ring, because the icing will glue the cake together for stability. Your icing should flow easily, without any breaks. If it breaks you probably need more water. Keep adding layers, going from largest ring to smallest. This is a really relaxing process because you don’t have to worry about it being perfect. A squiggle is a squiggle is a squiggle. It’s always nice to have a little helper. You can stick it with flags (or even flowers), like they do in Norway. This is about the time we decide that this cake should be a destination on Candyland, the board game. I rather liked the cake without flags. Which I think has a serene elegance to it. By the way, I wrapped this whole thing up in saran wrap and stored on my kitchen counter until the next day. It was delicious. 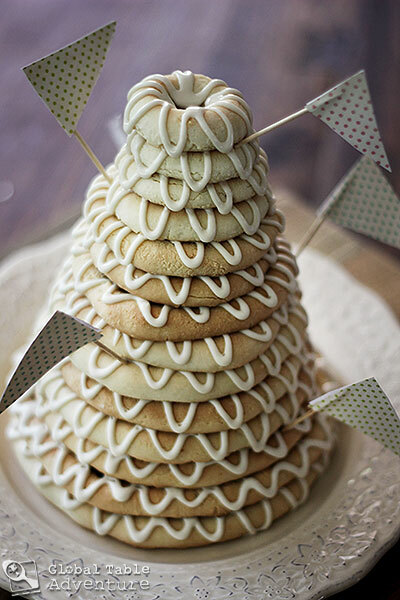 The cake is like a cross between an almond cookie and a meringue – soft, slightly chewy and totally divine. You don’t need a wedding or a birthday party to enjoy this cake. 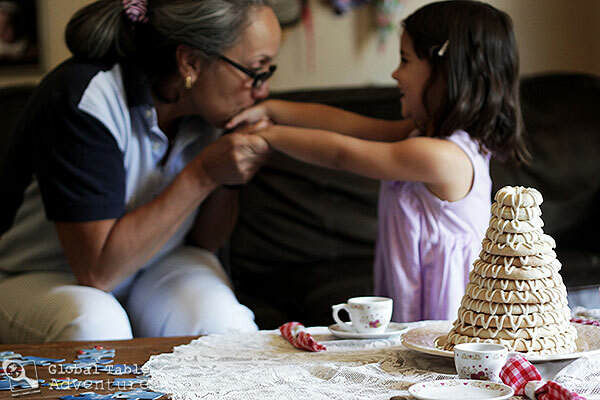 A tea party with a friend is good enough in this house. 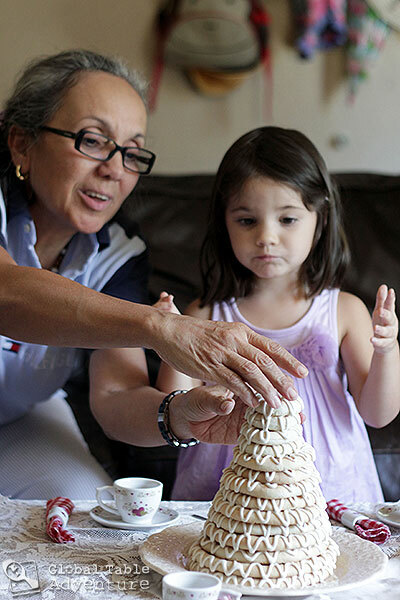 Uh oh – Ava quickly learned that the hardened icing really does stick those cookies together! You’ll need a little knife to separate the layers. 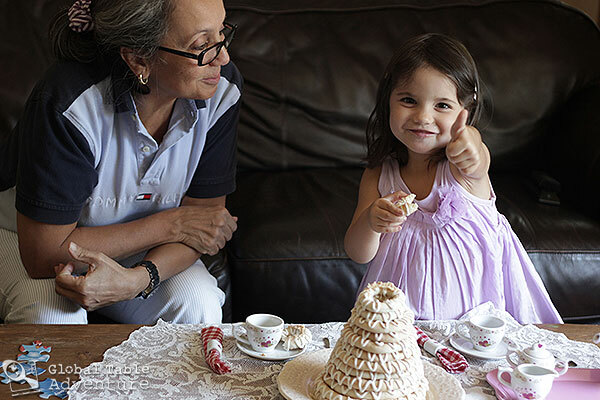 Thumbs up for the joy of kransekake… from our home to yours. 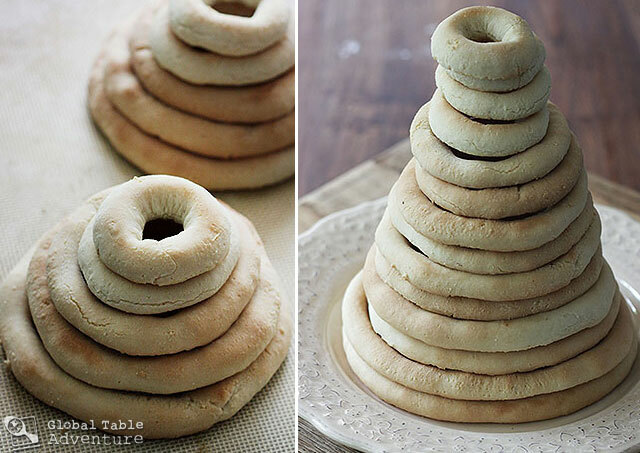 The kransekake is everything you love about playdoh, cookies, and cakes – all rolled up into one stunning cake. It tastes of sweet almond paste, dreams, and smiles. 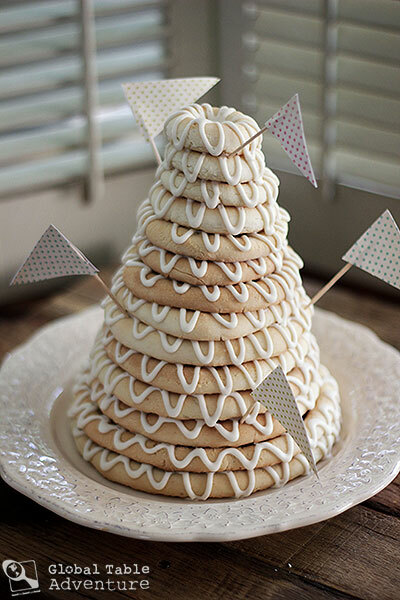 The Kransekake (which translates to wreathe cake) is often served for weddings in giant portions, or at birthdays and baby showers in smaller portions. Tradition dictates that there be 18 rings, although people vary it up all the time. 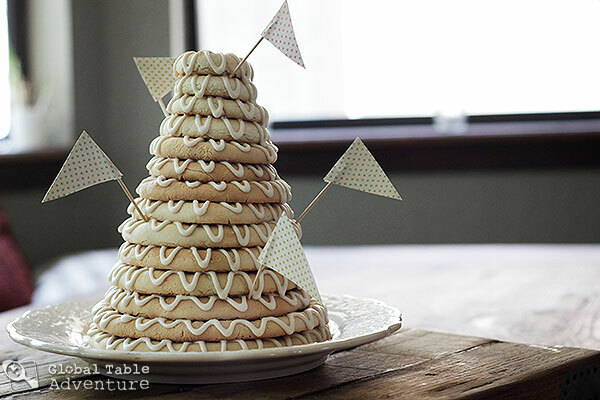 Today I’m sharing a kransekake that is a bit more manageable for, say, a travel-themed birthday party or family gathering. She’ll will feed 8-10 adults. 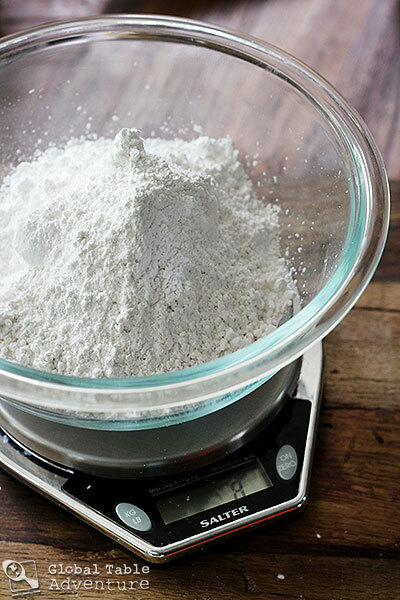 One important thing with this recipe is to measure everything by weight. This will ensure you have the proper ratio, no matter how your almonds are cut. You can sometimes do this on the scales at the grocery store. It’s okay, that’s what they’re there for. 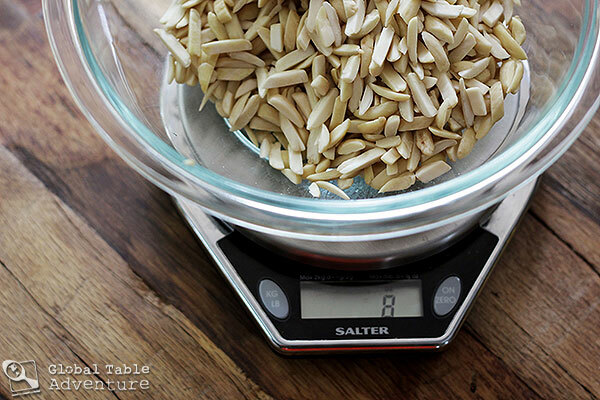 Once you have 8 oz almonds, grind them up in a food processor. 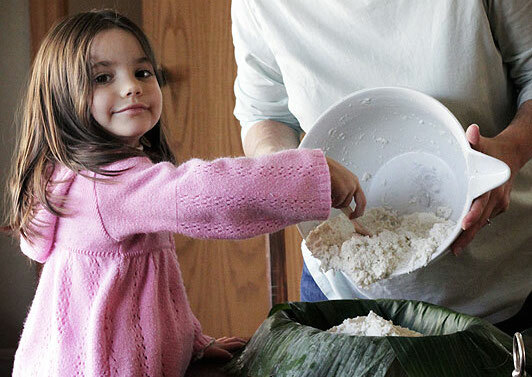 Next, add in a happy snowfall of powdered sugar… again, your best bet is to weigh it out…and the flour. You”ll need between 3/4 and 1 cup. Gently pulse this cloud of goodness together, evenly distributing the ingredients. Finally, stream in the two egg whites and oil. Pulse again until the mixture comes together into a soft ball. 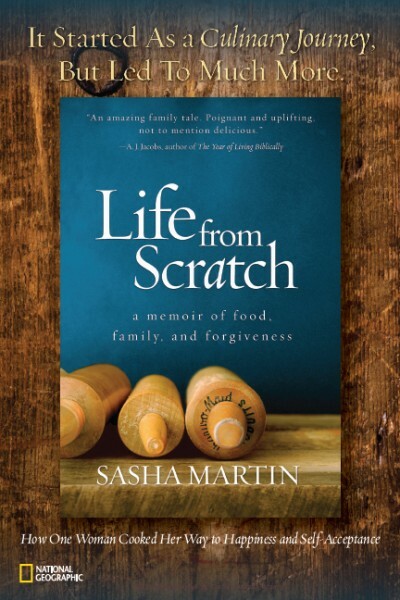 You should be able to roll this dough into ropes by lightly flouring your hands. If it is much stickier than that, you’ll need to add more flour. 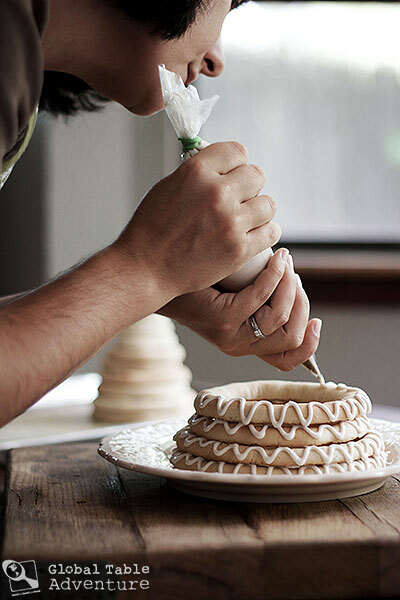 While most people use kransekake molds which set your cake to be a certain size, you can still make a beautiful cake without them (the molds, not the people). Either way, always start by rolling out the smallest rings and go larger. This makes sure they will stack and it also makes sure you don’t come up short before you get to the smallest ring, leaving a huge opening in the top of your cake. Here’s what I worked out: make 2 of each length: 4″, 6″, 8″, 10″, 12,” 14″ (they should all be equal thickness – about 1/2 inch around). Use a ruler, it really helps. 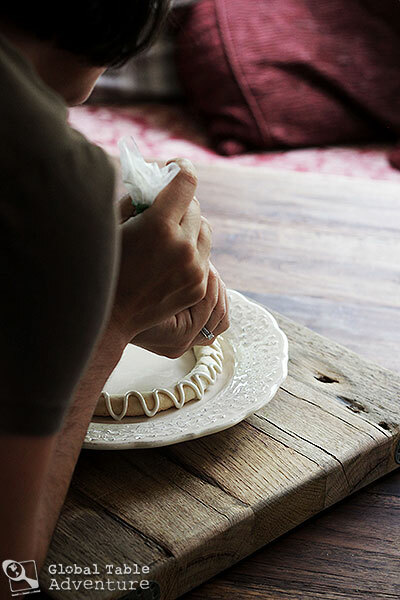 And work with lightly floured hands. Even with two of the same size, they bake up with slight variations, making a smooth stack. If you really want, you can make 1 each of 4″, 5″, 6″, etc but you might have to think a little harder when organizing them on the baking sheet. While you work, keep the dough covered with saran so that it does not dry out. 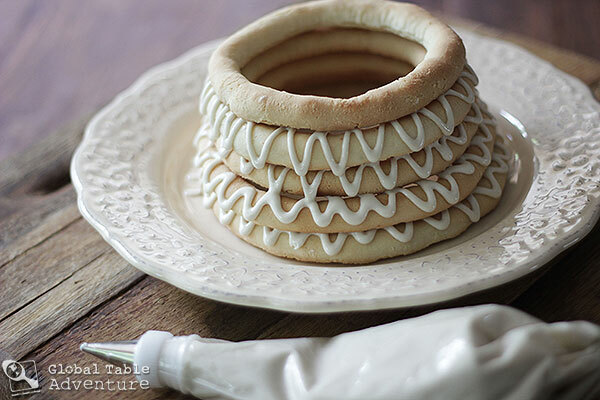 You can place the rings inside each other for baking as long as they do not touch. I managed to fit them all on two baking sheets. 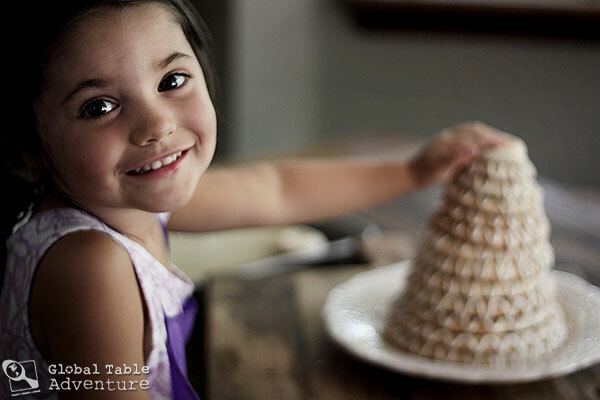 Make meringue icing by whipping meringue powder and icing together until peaks begin to form. Then add the sugar and continue beating until stiff peaks form. 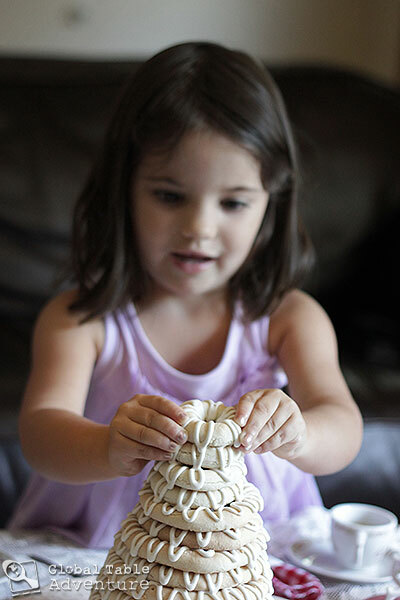 Carefully pipe zig-zags of icing all around the largest ring. Do it in a squiggly-wiggly hap-hazard way. The one thing you need to be sure of, is that you get the icing on the side and the top of the ring, because the icing will glue the cake together for stability. 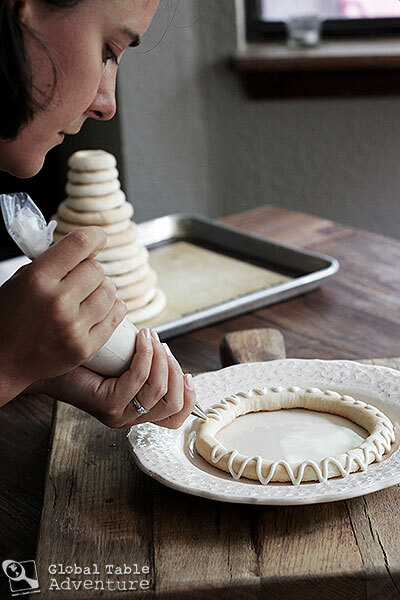 Your icing should flow easily, without any breaks. If it breaks you probably need more water. Keep adding layers, going from largest ring to smallest. Let the icing harden before storing. I wrapped this whole thing up in saran wrap and stored on my kitchen counter until the next day. It was delicious. 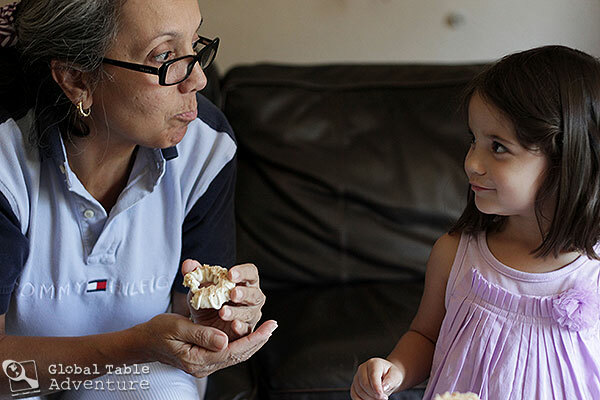 The cake is like a cross between an almond cookie and a meringue – soft, slightly chewy and totally divine. And yes, it travels very well if you’re careful. Make and bring a few extra rings in case some of them do break. Thanks Mette 🙂 Eating it from the bottom up – so obvious and yet we didn’t think of it. So.. yes, our leftovers looked rather silly. haha I’ll definitely do this next time! 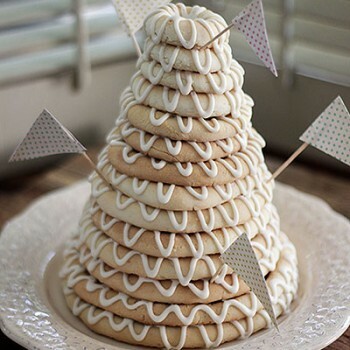 Is doing the icing in a squiggly-wiggly haphazard way anything like wibbly wobbly timer-wimey zig zag technique?! 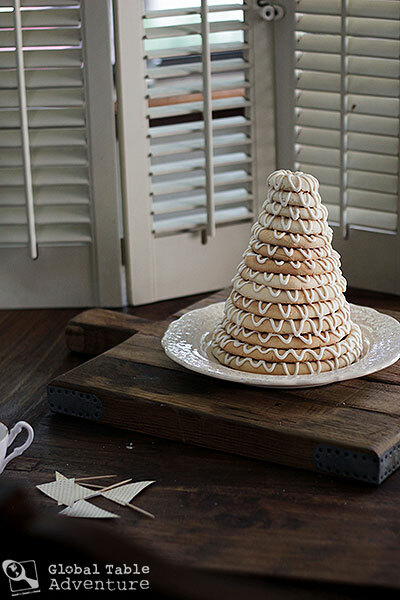 This seems so easy to make yet it’s quite impressive looking – great for a party or holiday. I like that its not overly sweet. Trying this for my wife’s birthday today. I wish I could say yes, but I have no idea how it would hold together. 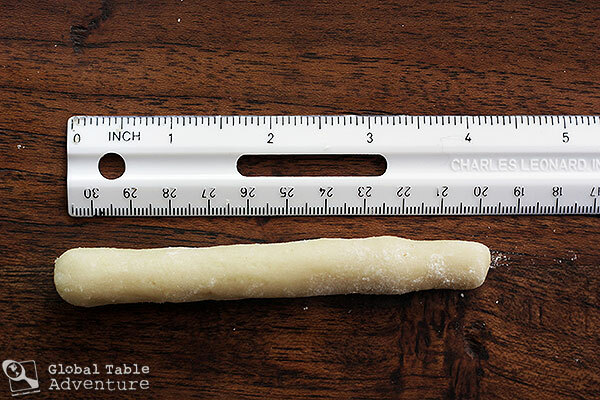 You might try making it with another cookie that holds its shape… like our raivas or similar http://globaltableadventure.com/2011/06/05/recipe-portuguese-cinnamon-cookies-raivas/ Good luck!! I can’t believe I’m seeing a recipe for Kransekake. I bought the rings and made the Kransekake and brought it to work. It was a big hit. My royal icing called for vinegar, which I put in, and it helped to cut down on the sweetness of the icing. Rolling out the rings was frustrating, they kep breaking! Thank you for the great description- will be making for my father’s wedding- how does it freeze (minus icing)? 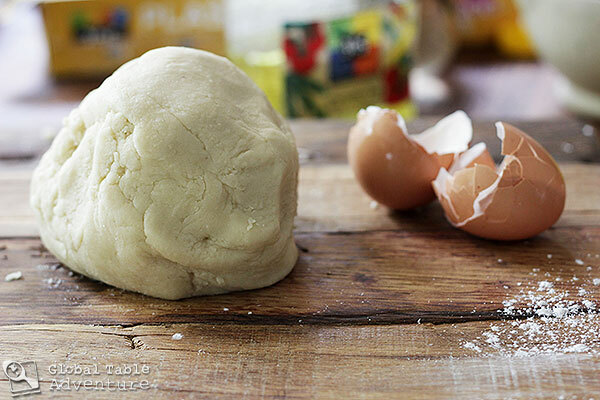 Can you make the dough ahead of time and freeze overnight? 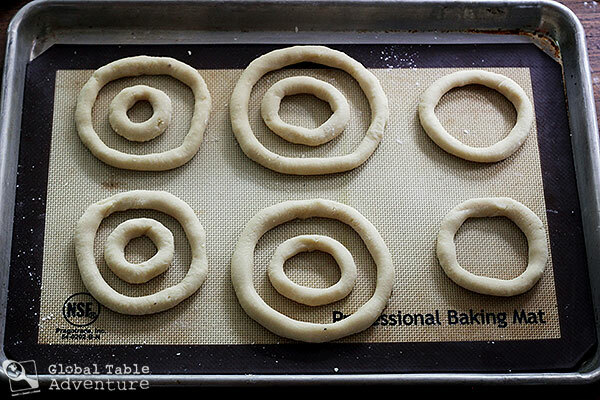 Hello, I have made a kransekaker today which I overcooked – thus making the rings too hard to eat. Can someone suggest how I might soften the rings to make them easier to eat – especially for people with dentures?